and where you want them to be. to connect with than ever before. external applications, but how efficient this integration is. (i.e. IBM MQ Series), or direct to databases. Whatever your integration needs, Bizagi can make it happen fast. What are Bizagi's process integration methods? to any data source, be it a modern application, a database or a legacy system. In our preferred way to connect, Bizagi EML offers a powerful connector to consume web services with no need of programming. EML enables seamless, real-time message routing and data transformation logic. 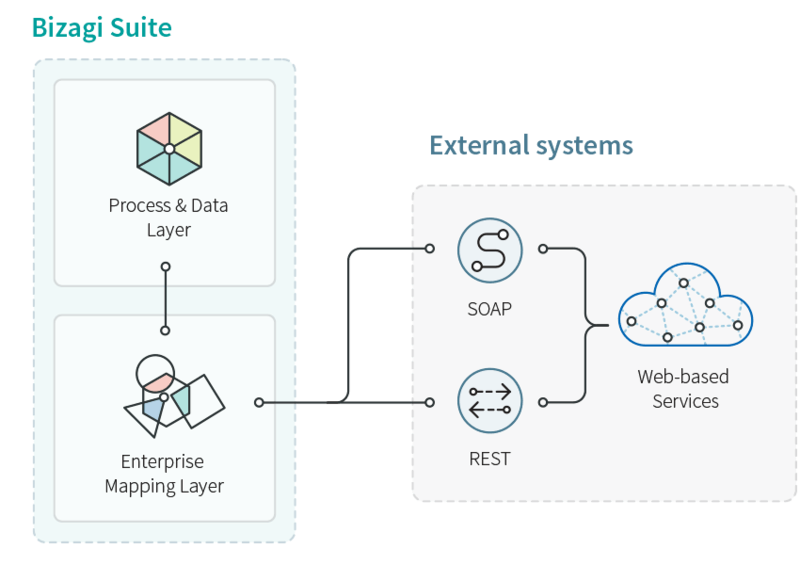 Bizagi APIs, smart and reusable SOA based web services, decouple business processes from IT infrastructure and enable connectivity between Bizagi BPMS and other applications such as ERP, CRM, SCM - even another BPMS, in a standard way. In our experience, such broker-driven integration delivers better performance with less effort. No web services? No problem. Reach out to your critical legacy data for process-level integration. 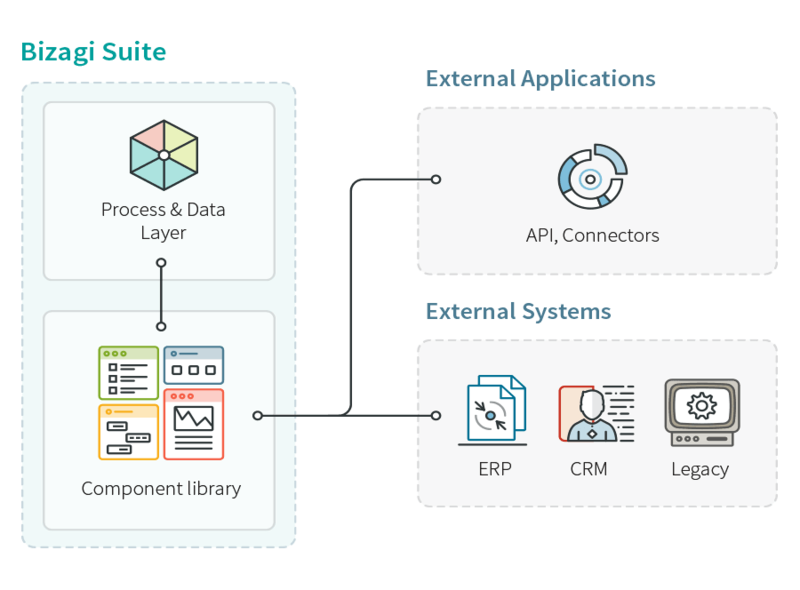 Bizagi's Component Manager acts as a library of reusable middleware components and ensures fast connectivity with your legacy systems allowing you enjoy extensible, high-performance and secure integration. Effective component registration makes business rules easy to retrieve and simple to understand, particularly helpful in cases where process logic requires complex calculation or processing. No maintenance headache, just clean connectivity. Isn't it time you moved to a virtual BPM architecture? Bizagi unique Entity Virtualization provides a simple yet highly efficient way to link with entities across any data source with no SOA capabilities, regardless of the interface. 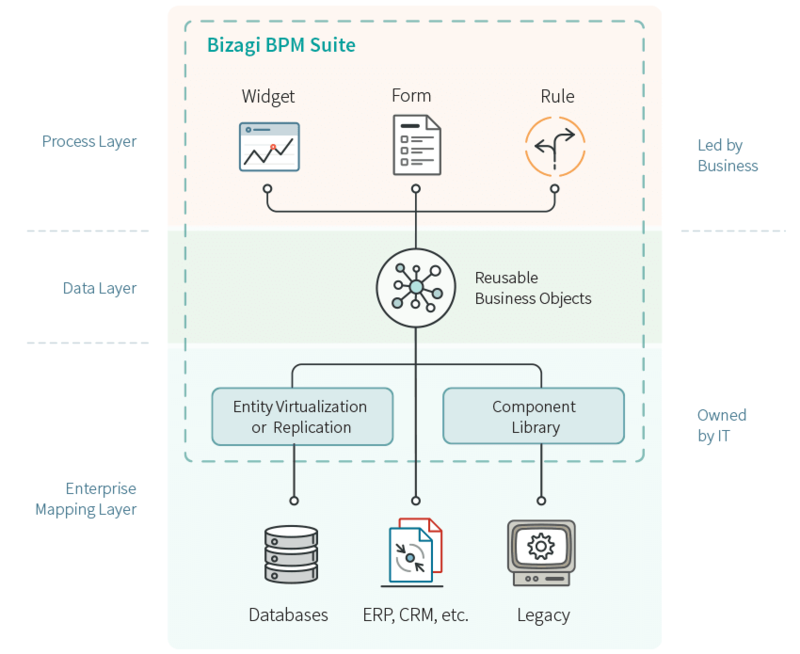 Its rules are very simple: If the data object exists within the enterprise, Bizagi BPMS connects to it; if it doesn't, it is created within the Bizagi database. Virtualize each and every entity to its physical location in the legacy system then create, store and reuse each time a change is made. This all takes place without any unnecessary replication. Enjoy seamless access to existing databases such as DB2 using our entity virtualization. Extendable Integration with CRM systems is vital to the success of any BPM project.